The Jr Hurricanes would like to congratulate former Jr Hurricane goaltender Cameron Leonard on being selected to the inaugural U.S. Women's National Team Goaltending Development Camp. Cameron has been selected as one of 18 women to participate in the camp – the ages will range from 16-29 and she will be the youngest goalie in attendance. The program is being created to mirror the Warren Strelow Camp, which is a USA Hockey goalie camp for the top male goalies in the country. Former Jr Hurricane Logan Halladay participated in the Warren Strelow Camp before he went on to represent his country in a tournament in Austria. It is a great opportunity to showcase your talent for future USA Hockey teams. She will be participating with current Team USA goalies Jessie Vetter and Alex Rigsby, along with several D1 college goalies. 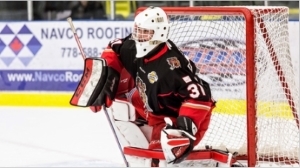 Cameron Leonard continues the strong tradition of goaltender development that the RYHA/Jr Hurricanes have experienced in recent years. She is known as a tireless worker. Everyone here involved with the program wants to wish her good luck this week! Way to go Cam! Congratulations and Good Luck at the camp! Congratulations to all players on their selection in the draft. Congratulations to the many Junior Hurricanes selected in April to at the CAHA Boys Prospect Tryouts. The 2015 Boys Prospect Tryouts were held April 10-12, 2015 at the Extreme Ice Center located in Indian Trail, North Carolina. The 1998, 1999 and 2000 players selected during the affiliate tryouts advanced to the Southeastern District Festival held May 10th. The Southeastern District Festival selects players to attend the USA Hockey National Camps and Festivals held during the summer. Twenty (20) 2001 birth year players, 2 Goalies, 12 Forwards and 6 Defensemen, selected from the Affiliate tryout to advance to the Southeastern District 14 Camp held annually during the summer. The Midget U16 AAA team completed a perfect weekend at the SE District Tournament in Coral Springs, FL. Coach Clay Cotie's squad went 3-0 in the preliminary games defeating the Florida Alliance 5-1, TPH Thunder 4-2 and the Washington Little Caps 3-2. This set up a remach with the TPH Thunder for the championship and a trip to Amherst, NY for Tier 1 Nationals. This wasn't the first time most of the players have faced the Thunder in the championship game of the SE District tournament. The Thunder have come out on top far too often. The game was a grinding match of wills with neither team developing much of an advantage early. The Thunder had the better of it with drawing 4 penalties to the Jr. Canes 1 through the first two periods. A good penalty kill and stellar goaltending from Marcus Nylander kept the Canes in the game and the second period ended 0-0. Early in the third period the Jr. Canes had the benefit of a 5 on 3 powerplay for well over a minute, but couldn't solve the Thunder defense and goalie. As the period started winding down the Jr. Canes started taking more control of play. In spite of the added pressure they couldn't find the back of the net and regulation ended with no score. Overtime was more back and forth play with few opportunities for either team. With time winding down the forward line of Ian O'Rourke, Riley Johnson, and Nicholas Wildgoose gained the offensive zone and got a shot on net. All three players crashed the net hard and had several shots on goal until finally Wildgoose was able to find a way to put the puck by the excellent Thunder goalie for the win! This was a great team effort from a team playing three players short and with two skaters playing through injury. Coaches Cotie, Brind'Amour, Wildgoose and Wagner did a great job juggling lines to keep the boys fresh and active. Everyone is looking forward to a great trip to Amherst in a few weeks. We would like to congratulate our Bantam AAA Major team on a great showing at the SE Districts Tournament. The team made it to the finals on Sunday in Florida but fell to the TPH Thunder team. We are proud of the teams accomplishments throughout the season! Two former Junior Hurricanes players, Holden Rogers and Matthew Filer, are making a name for themselves as referees. As part of its Hockey Weekend Across America campaign, USA Hockey staged a “Meet the NHL Officials Program,” and Filer and Rogers were selected from the region’s ranks of rising junior-level referees. The concept was to give youngsters the experience of being an on-ice official on NHL game day. Matthew and Holden are featured in an USA Hockey article covering their experience. The Squirt Minor team embarked on their final games and tournament of the season in Washington, D.C. over the Valentines / President’s Day weekend competing in the Congressional Cup Tournament. Prince William (VA) was the first team they would face. In two prior meetings, this team had proven to be tough opponent playing to a 3-3 and a rare 0-0 tie in those previous matchups. Again this was a tight affair, tied 1-1 until late into the third. The Jr Canes broke through with the go ahead goal in the last three minutes and added an empty netter 0to start the tourney with a 3-1 win. Palmyra (PA) got the better end of the team the next morning. Although outshooting the opposition 25-8, a stout goaltending performance resulted in a 2-0 loss. There was an unusual 11 hour scheduling gap before their next game against Ashburn (VA), a team 3-0 in the tournament so far. Coaches Andrew Barron, Donnie Lichty, Anthony Veilleux, and Ed Rosen used the extra time for a chalk talk to emphasize playing as a team and trusting their teammates. In a must win game to stay in contention to play for the championship, the boys took those words to heart playing arguably their most dominating game of the season. They blitzed Ashburn for 2 goals in the first two minutes and never looked back winning the game 5-1, outshooting their opponents 25-4, and frustrating the opposing coach into an unsportsmanlike penalty late in the game. It truly was a dominating performance. President’s Day morning arrived and an impending winter storm was on its way. Win and you are in was the scenario, and the Jr. Canes had plans for a storm of their own. Reston (VA) played them tight to a 3-3 tie into the third. A Palmyra loss on the other rink halfway through the period changed the scenario to a tie and we’re in. They battled and fought hard to maintain the tie and succeeded to earn a rematch with Ashburn in the championship game that afternoon. The afternoon arrived with snow cascading outside, and with certain tough travels home that evening, the Jr Canes wanted to make sure it was worth it. Ashburn played better to start this game, but again became frustrated in not being able to crack the Canes resolve, nor their defense. Taking two penalties late in the first creating a 5 on 3, the Canes capitalized with two successive goals on both penalties to take a 2-0 lead. Adding a goal in each the second and third periods, the Canes stifled the opposition to a 4-0 championship win. This tournament capped off a great season, and a great tournament run for this team. The team entered into four tournaments on the season, and emerged as the champion in each. 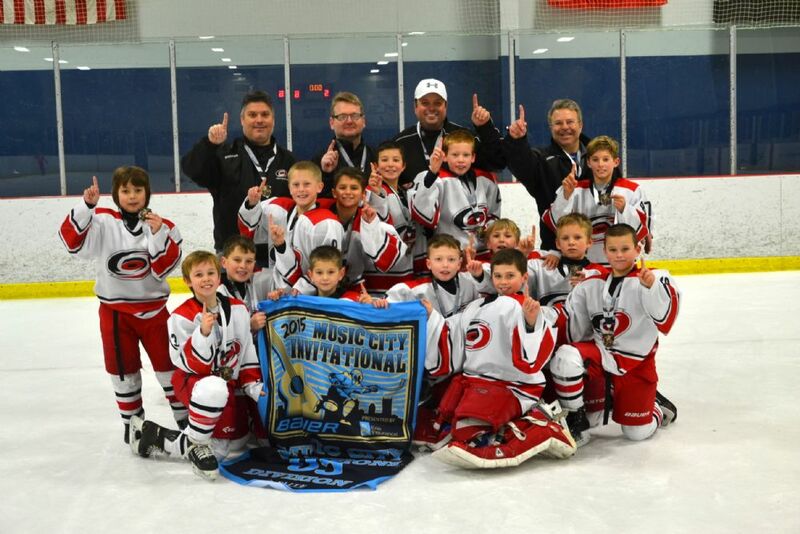 They finished the season as Southeast Earlybird Tourney Champs in Sept., Pittsburgh Thanksgiving Classic Champs in Nov., Bauer Music City Champs over New Years, and finally Congressional Cup Champs. Congratulations to the players, coaches, and families on wonderful season full of great accomplishments and growth. RYHA would like to congratulate goaltender Billy Christopoulos on his acceptance to play his NCAA Division I hockey at Air Force! Christopoulos currently is playing junior hockey for Alberni Valley in the British Columbia Hockey League (BCHL). He is currently 7th in the league for GAA and SV% and is carrying the load for a young squad. This is Christopoulos’ third year of junior hockey, playing for Des Moines in the USHL for the past 2 seasons before joining Alberni Valley this year. Christopoulos exemplifies the teachings of the Junior Hurricanes program – “Work Ethic and Discipline” – as our focus is developing the kids both on and off the ice. Click Here to see the the headline on Alberni Valley’s website complimenting his character. Christopoulos will join former teammate Sean Romeo at the D1 level (Romeo is a freshman at Maine University). The two goalies played together for Bantam and Midget for 3 seasons. 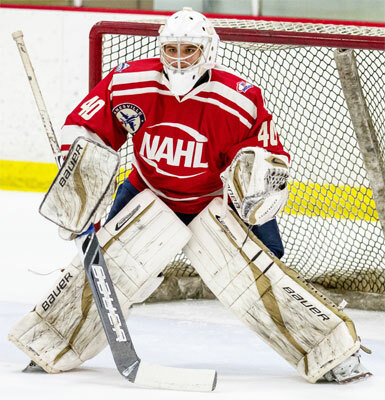 Christopoulos continues the tradition of strong goaltending from RYHA’s program with former RYHA goalie Logan Halladay (set to join Minnesota after his junior career) successfully moving on to play collegiate hockey. Christopoulos is known to the younger goalies as he frequently assists with on-ice sessions when he is home and loves to teach the next generation of goal tenders. The Goalie Department and everyone at the RYHA would like to wish him success at the next level! Congratulations to the Junior Hurricanes Bantam Major and Midget Minor AAA teams on their victories at the CAHA Tier I Championship Tournament in February. 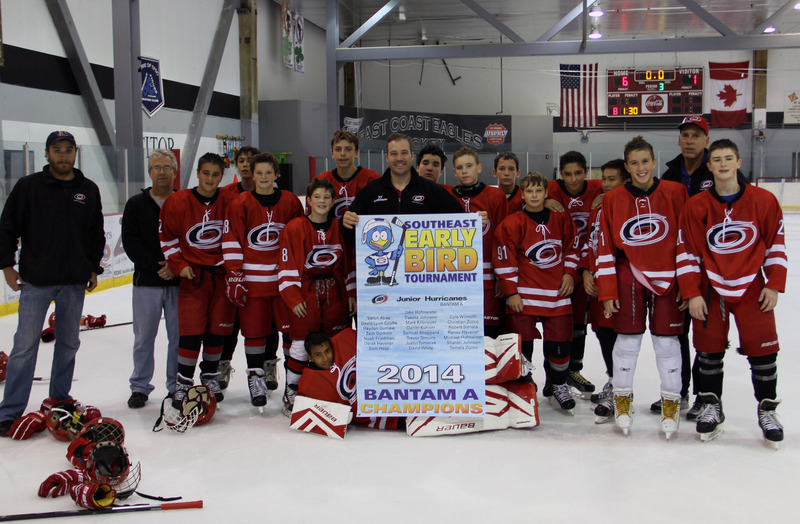 The Junior Hurricanes will represent CAHA in the Southeast District tournament March 6-8 in Coral Springs FL. The tournament serves as the USA Hockey National Tournament qualifier. Good luck Jr Canes!!! This past weekend we hosted our first home Superseries. It was such a great weekend with Nashville, Ashburn and Reston coming in to play. We made it in to a tournament format with the teams receiving points for wins, ties and shutouts. It came down to a 3 way tie for the final days seedings that had to be determined by penalty minutes! The final match ups were Ashburn and Reston in the consolation game. Reston had won vs ashburn the day before in a competitive matchup 5-4. The rematch ended with another great game and Ashburn came out on top 6-4. The championship game was next. It was the Jr Canes vs Nashville. We did beat Nashville the day before but they brought everything they had on Sunday. We had our hands full and were behind 4-2 in the 3rd period. Our boys dug in as a team and came back to tie it 4-4 at the end of regulation. We went to a 5 minute sudden death overtime and we scored the winning goal to win the weekend! The boys could not have been happier, their smiles said it all! Great weekend with some good competition and nice hockey families! Congratulations Jr. Hurricanes!!! The Bauer Music City Invitational was the team’s next tournament challenge. This tournament was a birth year tournament and again the team was faced with a tough opening opponent. Florida Alliance is a team comprised of the top kids from various programs throughout Florida and highly rated within the “MyHockey” rankings. Falling behind 2-0 in the early going, the team battled back to take 3-2 lead, but ultimately fell 4-3 in the end. Even though not a win, this first game strengthened the teams’ resolve and belief that they belonged with the best teams in the nation. The next three games proved to be dominating performances, outscoring opponents 32-4, gaining them a rematch with Florida Alliance in the championship game. Florida struck quickly and pulled to a 4-2 lead though two periods. After power play goal early in the third made it 5-2, it seemed the Jr Canes would not avenge their earlier loss. Little did anybody know “The Music City Miracle” was about to unfold. Zach Veilleux started the march back scoring a goal with 6:00 left. With his team still needing a last second spark, Kayden Wolitski jumped into a phone booth and donned his Superman cape. He scored with 3:23 remaining and again 59 seconds later tying the game at 5, prompting bedlam in the stands, and an unusual goalie change by Florida. Sticking with the hot hand, Coach Barron stuck with the same line, and it paid off 42 second later as Kayden scored the game winner capping one of the most improbable 6-5 comeback wins anybody will see. In a matter of 1 minute 43 seconds, Wolitski scored a natural hat trick, earned the game MVP, and provided a wonderful memory for every person in attendance. 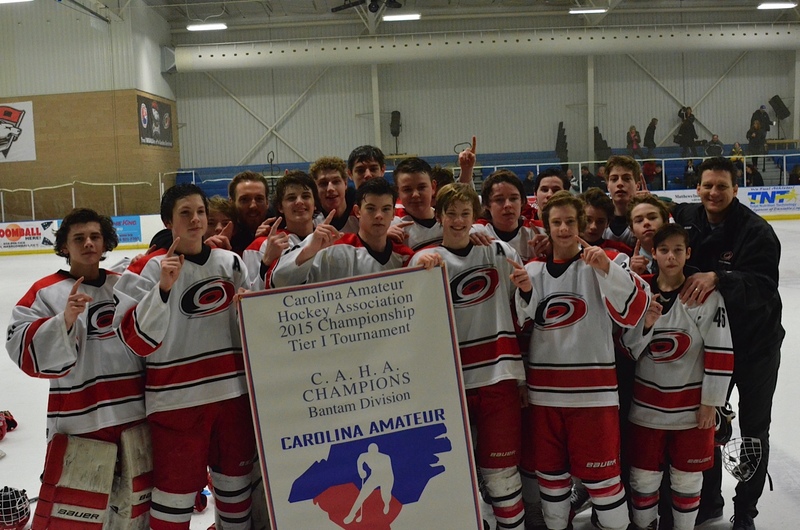 The Jr. Canes have participated in three tournaments this season, and have come away championship in each. Southern hockey is alive and well, and these boys continue to impress. The U10 Junior Hurricanes won three straight games on their way to the U10B division championship vs. The Richmond Generals at the annual Crabtown Showdown in Laurel, Maryland. 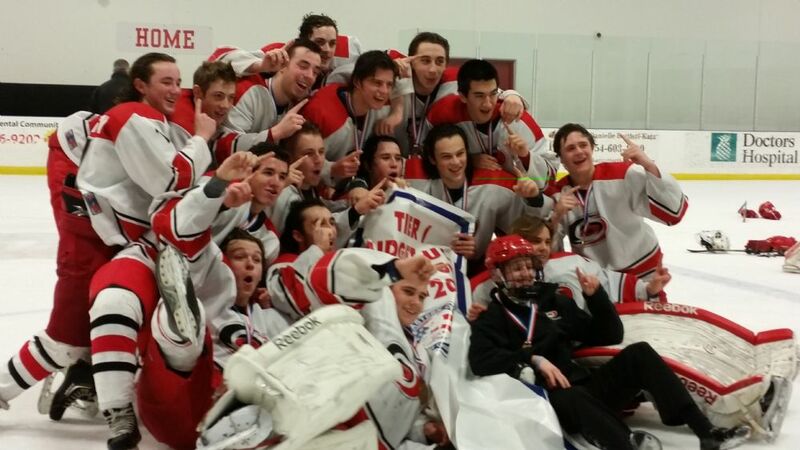 The Junior Canes surged in the first two periods of the championship game outscoring their opponents 3-1. Not giving up without a fight, the Richmond Generals scored two in the third period to tie the game in regulation. What followed was a novel overtime format that had everyone on the edge of their seats. First we went to 4v4 for 4 minutes. No score. We then went to 3v3 for three minutes. No score. In a first for our team we then went to 2v2 for two minutes. Still no score. During the 2v2 we survived a penalty kill resulting from a tripping penalty. It came down to a 1v1 for one minute. With about 30 seconds remaining in the 1v1 our hero, Drew Briganti, roofed a shot over the opposing goalie. Photo-finish! 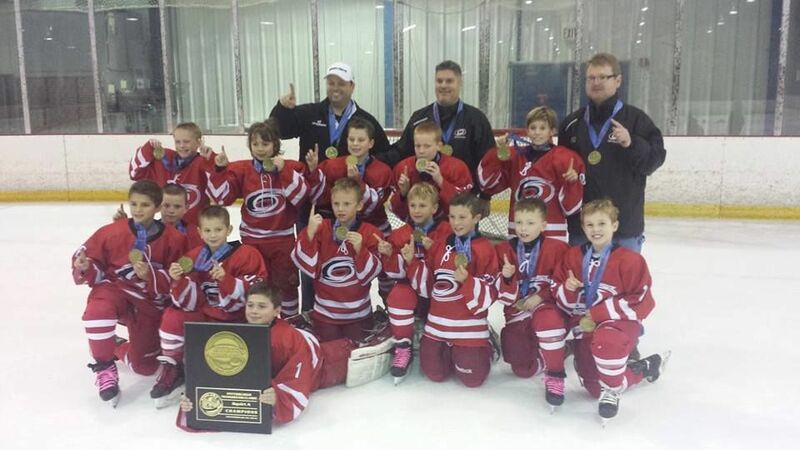 Most years, hurricane season ends in the beginning of November, but the Squirt Minor 05 Jr. Canes decided to extend it straight on through the holidays by “storming” into Pittsburgh and Nashville over the Thanksgiving and New Year’s holidays, winning a championship in each city. The Steel City Thanksgiving Classic was the first away tournament for these first year travel players. The schedule showed games against the local Pittsburgh 2005 birth year team and three Canadian 2004 birth year teams. The year difference would be a challenge, but one the kids were excited about. The opening game against the Woolwich Wildcats was a tight affair into the third. With the Jr. Canes down 2-1, a penalty against in the last two minutes seemed to have sunk their chances, but a clutch shorthanded goal by John Marshall Duffy in the last minute secured a 2-2 tie. The momentum and confidence gained showed into the next three games, winning them all, while outscoring their opponents 16-2. Finishing pool play 3-0-1 earned them a spot in the Championship Game and a rematch with Woolwich. Woolwich started quickly outshooting the Jr. Canes 12-2 in the first. Goalie Ryan Kalina was equal to the task, turning away all shooters until the Jr. Canes struck midway through the second. John Marshall Duffy, once again, ignited his team breaking through for the first goal. Conner de Haro and Cole Latzy led the defense allowing only 3 shots through the last two periods and dominated the rest of the way to a 3-0 win, their third shutout in a row. Duffy finished with 2 goals and an assist, having a hand in all the scoring. Not bad for a bunch of “Yankee Midgets”, as one Canadian parent had labelled them earlier. 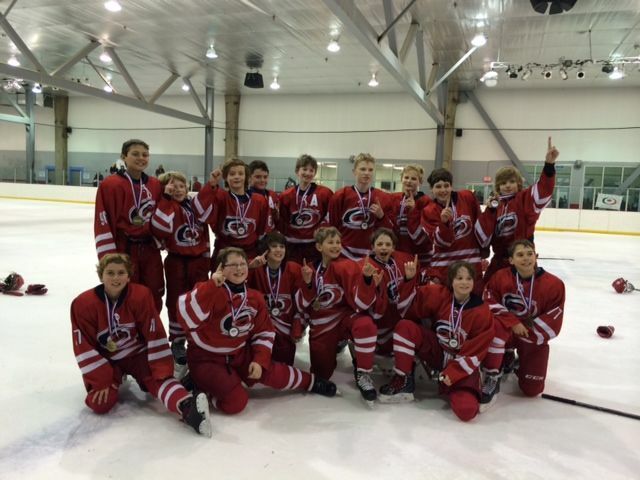 The RYHA Jr Hurricanes Bantam A went undefeated through the tournament and won the championship game with a 6-1 win over the East Coast Eagles. Team was lead with some strong goaltending by Varun Atree and Cole Wilmoth and scoring throughout the tournament came from all three lines. 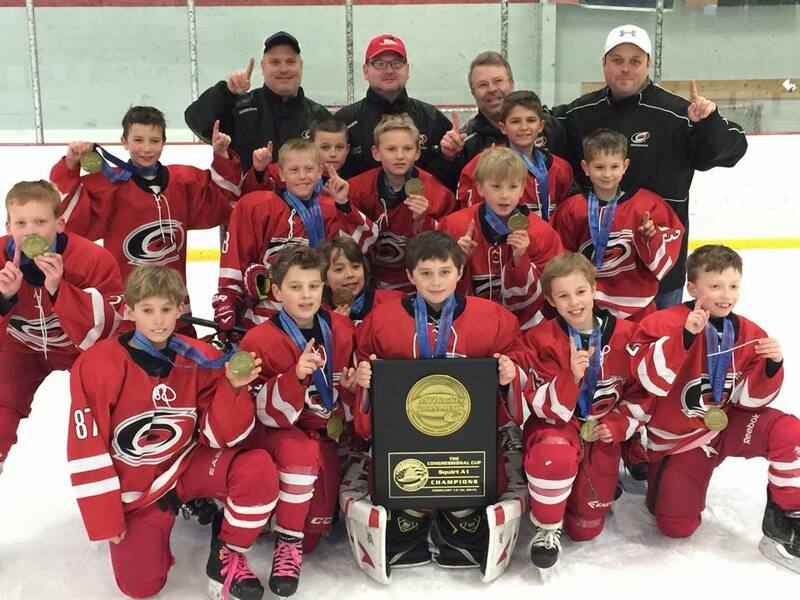 The RYHA Jr Hurricanes Squirt 9U Minor AA team won their first tournament of the season at the Southeast Early Bird tournament here in Raleigh. Former Junior Hurricanes goaltender Sean Romeo will start his freshman year at the University of Maine this coming Fall. The University of Maine is part of the prestigious NCAA Division I Hockey East Conference. 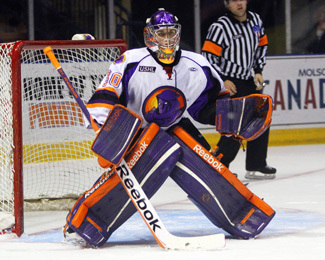 Romeo played 3 seasons with the USHL Youngstown Phantoms. Prior to that, he played on the Junior Hurricanes Bantam and Midget AAA hockey teams. Former Junior Hurricanes goaltender Logan Halladay has made a commitment to play NCAA Division I hockey for the University of Minnesota of the BIG 10. Halladay has been with the Janesville Jets of the North American Hockey League (NAHL). Former Junior Hurricanes defenseman Scott Moldenhauer will start his freshman year with the Western Michigan University Broncos NCAA Division I hockey program this fall. 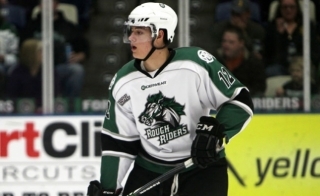 Moldenhauer played 2 seasons with the USHL Cedar Rapids Rough Riders and was the 2012 CCM Hockey Showcase Top Defenseman. The Carolina Hurricanes Prospects Development Camp is being held July 21-26 at PNC Arena. Goaltender Alex Nedeljkovic suffered a broken thumb in summer training and will miss the camp. With Nedeljkovic out, former Junior Hurricane and Cary native Logan Halladay will man one of the nets in this week's camp. 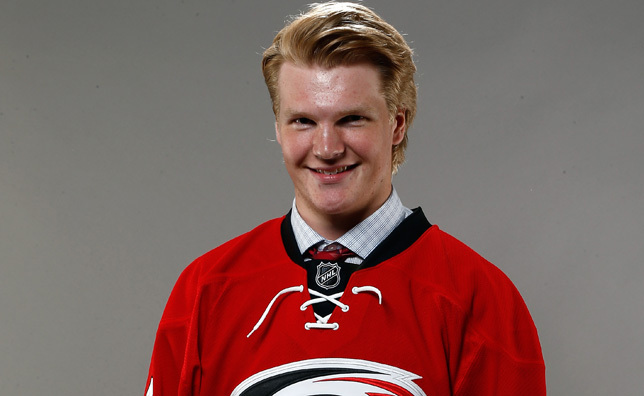 Halladay is one of three former Junior Hurricanes who will participate in the Prospects Camp. He joins Canes fourth-round draft pick Josh Wesley and camp invitee Bryan Moore. Congratulations and best wishes to all three! and see the CanesVision interview with Logan and his parents. It was an exciting 2014 NHL Draft weekend, not only for three young men from North Carolina but also for the RYHA Junior Hurricanes program. Josh Wesley was selected by the Carolina Hurricanes in the fourth round, 96th overall. It was great to hear as a former Canes player and now employee, that Wesley grew up wearing Canes gear as kid, then wearing the sweater in our Jr. Hurricanes travel program and now at the top level on draft day. Other top local players and former Junior Hurricanes, while not drafted, also have a bright future. Bryan Moore is heading straight to the New York Rangers prospect camp on a free agent try-out and Logan Halladay is preparing for another season in USHL Bloomington Thunder organization before heading to Minnesota on a scholarship in the near future. The success of these young men not only shows the hard work and dedication they have put in on the ice, but also highlights the dedication to development the RYHA has put into the Triangle over the past 26 years. The RYHA’s continued passion to develop and grow our young talent is unprecedented here in North Carolina and will continue to succeed for many years to come! 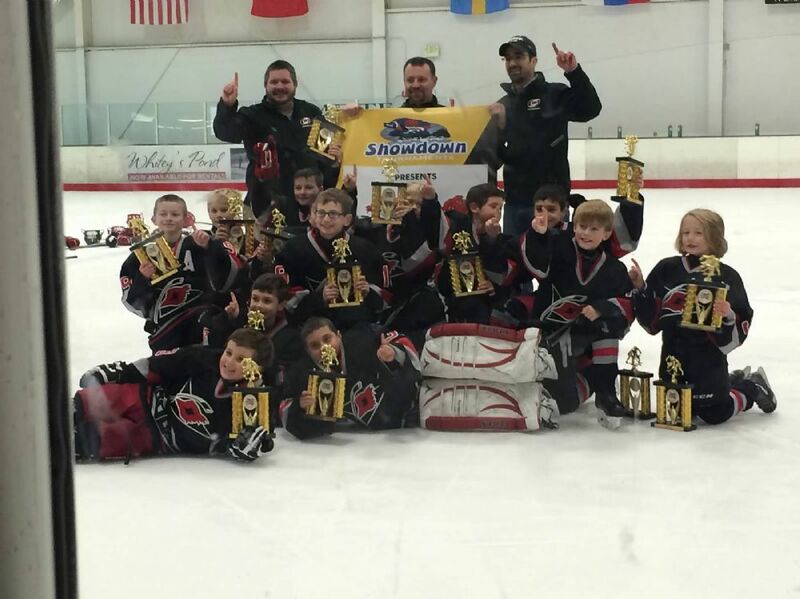 By utilizing the USA Hockey age specific model and having dedicated coaches and staff, the RYHA Junior. Hurricanes program is and will continue to be a model for success. The Carolina Hurricanes will continue to support the local youth hockey community and strive to unify the area from year to year. You can find more about these three great players in the links below!